Blackbird is a Beatles song from the double-disc album The Beatles (also known as The White Album). Blackbird was written by Paul McCartney, though credited to Lennon–McCartney. McCartney explained on Chaos and Creation at Abbey Road, aired in 2005, that the guitar accompaniment for "Blackbird" was inspired by J.S. Bach's Bourrée in E minor, a well known lute piece, often played on the classical guitar. As children, he and George Harrison tried to learn Bourrée as a "show off" piece. The Bourrée is distinguished by melody and bass notes played simultaneously on the upper and lower strings. 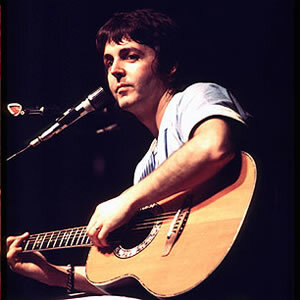 McCartney adapted a segment of the Bourrée (reharmonised into the original's relative major key of G) as the opening of "Blackbird," and carried the musical idea throughout the song. The first night his future wife Linda Eastman stayed at his home, McCartney played "Blackbird" for the fans camped outside his house.